This stunning beachfront resort offers breathtaking views of the Gulf of Mexico. Guest rooms are elegant and comfortable, featuring either a private balcony or a spectacular Gulf view. The resort is just steps away from the beach, fishing piers, shopping, fantastic restaurants, and family entertainment. Guests can visit the Moody Gardens, Kemah Boardwalk, Grand Opera House and Galveston Island Historic Pleasure Pier. 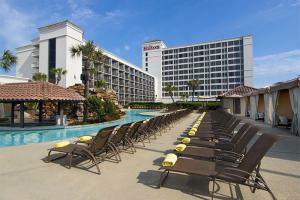 Located within steps of the Galveston Island Convention Center and the beach.